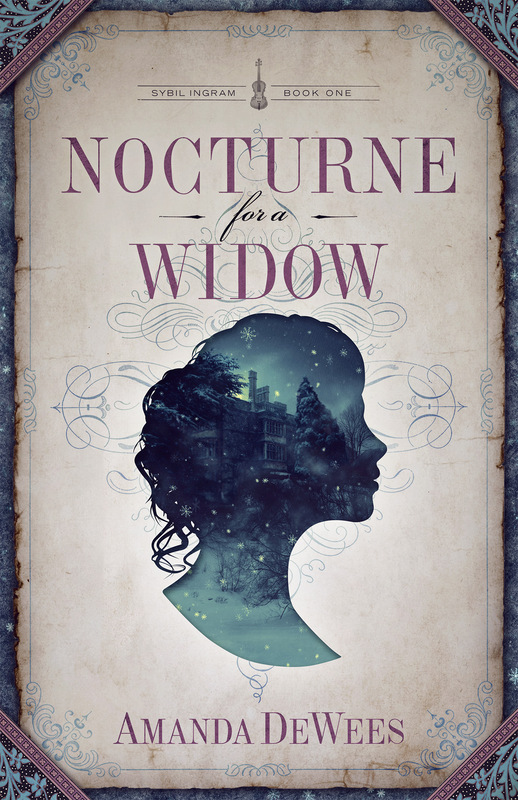 Get Ready — Nocturne For a Widow Is On the Way! Here’s a first ever for Sweet Rocket — a cover reveal! Ramping up the excitement for Nocturne for a Widow, the new historical romantic suspense novel from Amanda DeWees, here’s a teaser in the form of the cover for Nocturne, which will appear in ebook and paperback soon. The heroine of Nocturne is none other than our favorite fictional Victorian-era actress, Sybil Ingram, who made a memorable appearance in DeWees’ recent With This Curse. Sybil leaves the theater world (Under A Cloud, of course) to marry, but when she’s widowed and left nearly penniless, she latches on to an ill-starred inheritance from her late husband — a mysterious mansion in the wilds of the Hudson River Valley. In short order, Sybil finds that life in her mansion is far from palatial. Strange doings in the house, a local society queen who is perhaps as dangerous as disapproving, and to cap it all, a challenge to her inheritance in the form of handsome, hot-tempered Roderick Brooke, whose own career as a violin maestro has ended in dark scandal. Look for my review of Nocturne For a Widow here on Sweet Rocket soon, and for release news, follow Amanda on Facebook at facebook.com/AuthorAmandaDeWees, or keep an eye on her website, amandadewees.com. Until then, enjoy this gorgeous cover, designed by James T. Egan of Bookfly Design! 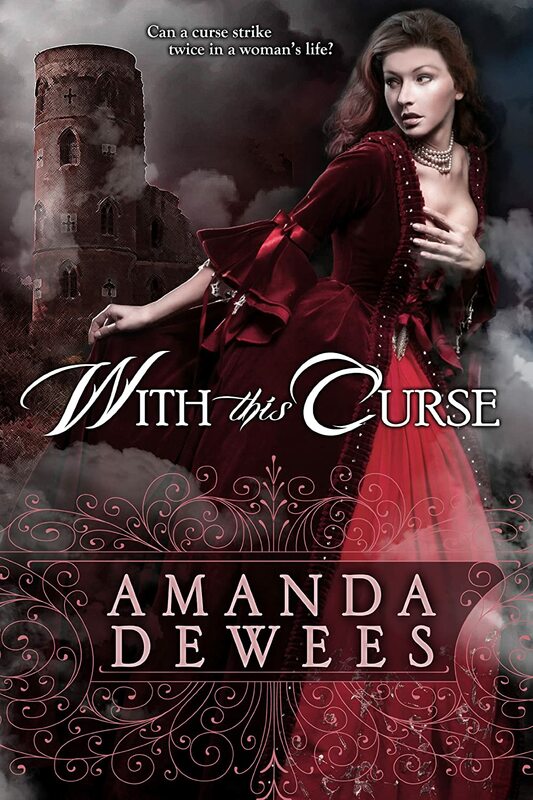 Categories: Book News, Cover Art, Gothic, I'm In Love With, Lovely Romance Novel Covers | Tags: Amanda DeWees, cover reveal, gothic romance, lovely romance novel covers, Nocturne For a Widow, Sybil Ingram, With This Curse | Permalink. 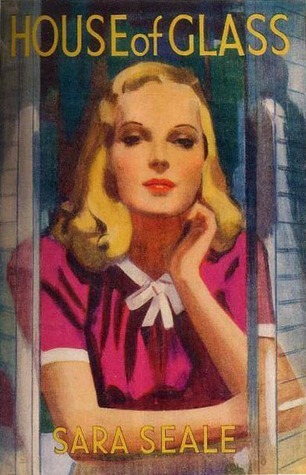 The 1944 hardcover edition of House of Glass with its beautiful artwork. There’s a very good reason that so many romance novels are retellings of classic fairy tales. Both fairy tales and romance novels exist in a realm of pure magical thinking where suspension of disbelief is the norm, fantastic characters can seem if not ordinary then sympathetic, and situations we’d never accept as possible or even attractive in real life are not only acceptable but somehow believable. You need that kind of fairy tale mindset if you’re going to enjoy vintage Mills & Boon/Harlequin romances. If the author is Sara Seale, magical thinking is required. Though she’s all but forgotten now, Seale was one of Mills & Boon’s earliest superstar authors. 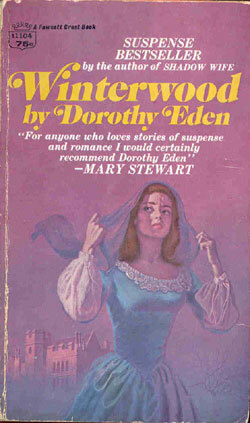 Most of her books were written and first published in the 1930s-1940s, when the worlds she creates were slightly more possible, and the characters who populate those worlds a bit less disturbing. Of the ten or so Seale books I’ve read, in all but one, the hero is much older than the heroine, and is usually in some position of authority over the heroine. Hers are the predecessors to all those boss-secretary and nurse-doctor romances that accounted for 90% of the Mills & Boon output from the 1950s through the late 1980s. But Seale takes this tried and true romance formula to places I would never have imagined. Almost all her heroines are teenagers or just barely over 18, poor and very innocent. 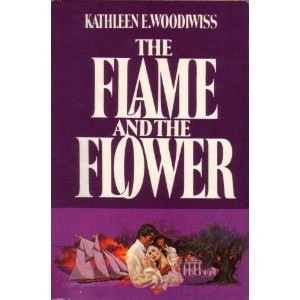 A good half of Seale’s books are 20th century updates of that Regency staple, the guardian/ward romance, and she seems to have been heavily influenced by the work of Jean Webster, famous for Daddy Long-Legs, that immortal story of the orphan who falls in love with her anonymous — and much older — benefactor. 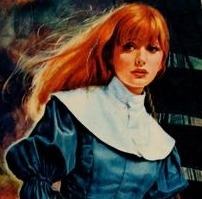 In one of Seale’s books, the aptly titled Orphan Bride, the hero, bitter and disappointed in love, actually picks the heroine out from an orphanage and places her with his aunt and uncle so that he might oversee the raising of his future wife. It’s a testament to Seale’s talent that she can make these cringe-inducing plots work almost as often as not. The best of her books — and there are several that are undeservedly forgotten gems — are coming-of-age stories, where we see the heroine through a year or more, growing from an adolescent into a woman, with the hero coming to love her as the woman she becomes. But in all of Seale’s oeurve, House of Glass/Maggy stands as one of her more bizarre waif/older man stories. On the surface, it’s nothing readers of historical and Gothic romance haven’t seen a million times; that Seale wrote it as a contemporary in 1944, and Mills & Boon/Harlequin kept reissuing it as a contemporary as late as the 1970s is what makes the book such a curio. Maggy was young, alone in the world after her father’s death, untrained and too inexperienced to make much of a way in life; although she had a job of sorts, as companion/dogsbody to a tyrannical old lady, life did not seem to be holding out much of a future for her. Garth Shelton, years older than Maggy, crippled and embittered, was indifferent to anything that life might have in store for him. All the same he was touched by young Maggy’s plight – and in a quixotic fit he proposed marriage to her as the one way in which she could escape. And so began their strange life together – a marriage that was no marriage, between two people who might yet come to realise their growing feelings for each other, if only Maggy could forget the one barrier to Garth’s loving her – his former love, the elusive and lovely Sabrina. “Don’t shut me out” she begged. “Please!” Maggy knew her words violated the terms of their relationship. But she was no longer the immature girl who had married Garth with no thought to the future. Even Garth had changed. He had thought nothing mattered, saw no reason to live. But the strange months of their marriage had revealed startling chinks in his armor of detachment. Could she now persuade him to grasp the one chance that might give them a full life together? If it tells you anything about what’s in store for you when reading House of Glass, I was under the impression I was reading an historical Gothic romance (my mistake; it was a strange library edition of the late 70s Mills & Boon release that I picked this with a bunch of Gothic paperbacks at a library book sale). Everything about the book screamed Gothic. The book’s early 20th century setting is so vague that, until cars are mentioned, it may have taken place at any time between 1820-1950. Maggy and Garth meet at an invalid spa in what might have been Harrogate or Bath in a Regency (all we lacked was a mention of taking the waters). I don’t remember Maggy’s age, rightly, but she’s definitely less than twenty, whereas Garth is maybe thirty-five. 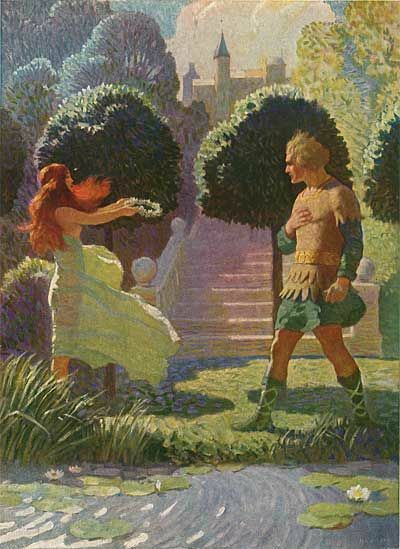 At this point, the book becomes a cross between Rebecca and a guardian/ward romance; Garth whisks Maggy off to a draughty, isolated castle in Ireland, populated by maids who tell tales of banshees and a housekeeper who is devoted to the Sheltons — or the Shelton women, at least, of which Maggy will never be, so far as the housekeeper is concerned. On her way to her happily ever after, Maggy is disdained by most of the servants and Garth’s chilly relations, teased with hints and clues about the elusive Sabrina, led to a near-fatal drowning in a bog (yes, a bog) by the awful housekeeper, and almost led astray by a local boy who gives her the attention Garth will not (this, by the way, is another familiar device in Seale’s books — the near-seduction of the innocent by a fellow adolescent). In the best of Seale’s books, the interactions between the hero and heroine build slowly but surely toward the HEA, and House of Glass is no different. The book lags in the middle, with Garth and Maggy not spending enough quality time together, but almost all the interactions between Garth and Maggy are memorable and poignant. If Maggy is irritatingly naive at times, and Garth snappish, they are most times so kind to each other. Throughout the story, they’re always giving each other thoughtful little gifts, each symbolic of the way their relationship grows. House of Glass definitely hits its stride toward the end, and if it never reaches anything nearing passion, it is precious. The book has one of the most unusual endings I’ve ever read in a romance novel, one that was not out of keeping for mainstream novels of the 1940s, but so unlike the usual M&B ending that it’s a wonder it was not revised. Speaking of the period… As a contemporary, even for the 1940s, this book utterly fails. The clearly mid-century references — cars, telephones, Maggy’s lack of training for a job — are jarring and seem added after the fact. The medical diagnoses/treatments seem Draconian for even the first half of the 20th century. There are also a few strange ethnic references (something you unfortunately encounter often when reading vintage Mills & Boon books). 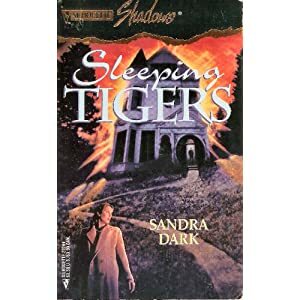 Which begs the question that is the next point of this rambling — and far too long — post: what on earth possessed Mills & Boon, to say nothing of Harlequin, to keep reprinting this book as late as the 1970s, and as a contemporary? 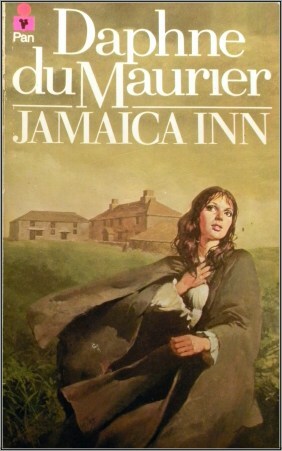 And Mills & Boon was indeed hellbent on marketing the book as a contemporary, going so far as to retitle it as the jaunty Maggy at least twice, with covers that placed the story squarely in the 1960s and 1970s. The time travel was strange enough — the covers themselves were baffling. For one Maggy cover, we have a mid-1960s collage that jumps on the nurse romance bandwagon, and has absolutely nothing to do with the story. 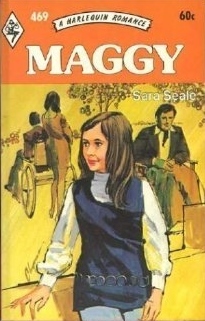 For the early-1970s Maggy cover, our heroine has become a thirteen year-old hippie. 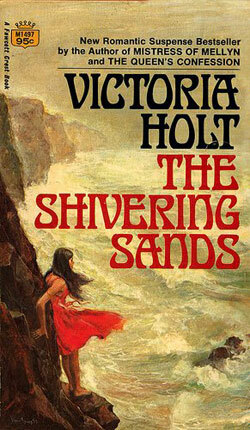 But the strangest cover by far is for a later 1970s edition of House of Glass. 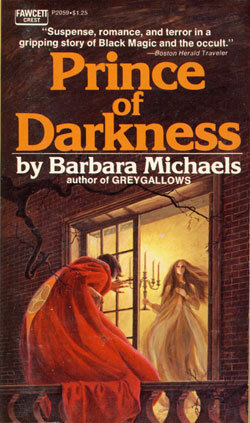 This was likely the cover that should have accompanied the library edition, and it’s interesting that even without it, I still took the book for a Gothic — it the classic hero-menacing-the-terrified-heroine Gothic cover. It also makes little more sense than the other post-1950s House of Glass covers. As Garth is wheelchair bound, it seems more than a little impossible that he’d be looming over Maggy; since the scene never happens in the book, it’s disingenuously random. 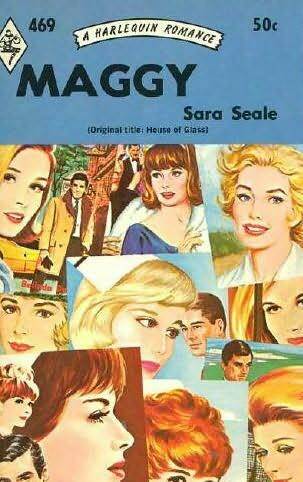 So there you have the strange saga of Sara Seale’s Maggy. As a final aside, this story was evidently dear to Seale’s heart — she repurposed the majority of the book’s content for one of her later novels, The Gentle Prisoner, which was also reprinted numerous times from the late 1940s through the 1970s. To bring this train wreck to a smoking conclusion, I give Maggy/House of Glass four pieces of imitation Waterford crystal. If you are a fan of vintage Mills & Boon or Gothic romances, it’s worth hunting down. Categories: 4-Star Reads, Bizarre Romance Novel Covers, Cover Art, Gothic, Historical Romance, Rediscovered, Reviews, Vintage Harlequin/Mills and Boon Romance | Tags: Daddy Long-Legs, gothic romance, House of Glass, Jean Webster, Maggy, Mills & Boon, Orphan Bride, Sara Seale, The Gentle Prisoner, vintage contemporary romance, Vintage Harlequin Romance, Vintage Nurse Romance Novels | Permalink. One of the aspects of the e-book experience that I enjoy most is the ability to sample a book before you buy it. Sampling serves two very valuable purposes for me as a reader — first, it prevents buyer’s remorse, and second, it gives me something to do while I wait. So there I am, sitting at the gas station waiting in line to pump gas, and I go to the Kindle app on my phone to find a sample to read. Unfortunately, the one I chose this particular time was A Bed of Thorns and Roses by Sondra Allan Carr. I say “unfortunately” because I somehow ended up sitting parked at a Speedway for an hour before I could tear myself away long enough to drive the hour or so home. And then I was tempted at least twice to pull over on the side of the road just to read. Needless to say, it’s a good thing I didn’t have to work the next day, because I was up all night reading. There was no way I wasn’t going to be intrigued at the very least by this book. Although it’s not marketed as such, it’s clearly got that Gothic vibe I love so much. And blame it on a children’s book version I had as a girl, but I’ve always been a sucker for a Beauty and the Beast story. A Bed of Thorns and Roses delivers on that score. And as one Amazon reviewer points out, this isn’t a one-single-rakish-scar-on-the-hero’s-otherwise-gorgeous-face kind of story, either. In this respect, the book almost hews more closely to Phantom of the Opera territory, mask included. But A Bed of Thorns and Roses is much more than a fairy-tale rehash. It’s an excellently written, intelligent and emotional. Happily-ever-after doesn’t come easily for Jonathan and Isabelle. These two don’t spend the first half of the book veering between bickering and mental lusting, nor is there a lot of created drama. Their interactions move believably from painfully uncomfortable to guardedly pleasant to frank enjoyment, and their reasons for being suspicious of each other and of doubting that they can have a future together are both reasonable and believable. I keep repeating the word “believable” for a reason. Despite the book’s fairy tale origins, both characters are so believable, Isabelle especially. Unlike many historical (or contemporary) heroines who, despite their ever-so-humble upbringings, are always well-educated and know just what to do in any situation, Isabelle’s ignorance is both refreshing and incorporated into the plot. And for once, we have a “beast” who is not also a worldly, experienced rake. Jonathan is educated, but socially and emotionally inexperienced. The best scenes in the book are when the two are learning together, such as my favorite scene, a picnic that I refuse to say anything more about for fear of spoiling it. My quibbles with A Bed of Thorns and Roses are small but pronounced. The first, one mentioned in several Amazon reviews, is a secondary relationship between Jonathan’s doctor/friend/mentor Richard and Isabelle’s sister which just seems extraneous. Another is that we only get bits and pieces of these experiments that are so important to Jonathan — I really expected that to be an integral part of his and Isabelle’s development. The third, which I can’t get into without revealing too much, concerns Isabelle’s secret. Suffice to say there is the Big Secret, and a smaller secret that goes along with it. For me, the Big Secret was enough; the smaller secret just seemed to gild the lily. But again, these are quibbles. I give A Bed of Thorns and Roses 3 out of 5 clever disguises. Go ahead — download the sample and try to resist A Bed of Thorns and Roses. If you find yourself sitting at the gas station for hours, I’ll take the blame. 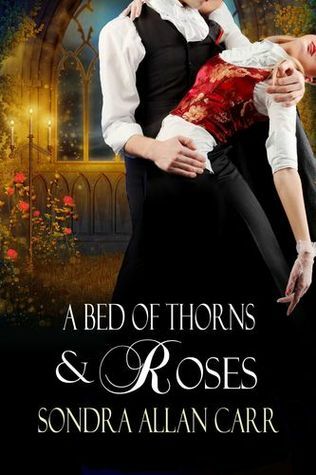 Categories: 3-Star Reads, Gothic, Historical Romance, Reviews, Romance | Tags: 3-Star Read, A Bed of Thorns and Roses, Beauty and the Beast, gothic romance, Sondra Allan Carr | Permalink.